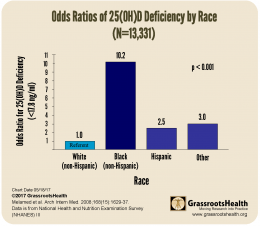 Does your skin color affect your chance of vitamin D deficiency? Data from the National Health and Nutrition Examination Survey (NHANES) III shows that non-Hispanic blacks are at more than 10 times greater risk than non-Hispanic whites of being in the lowest quartile of 25(OH) vitamin D serum measurements. Hispanics have 2.5 times the risk, and other races have 3 times the risk.